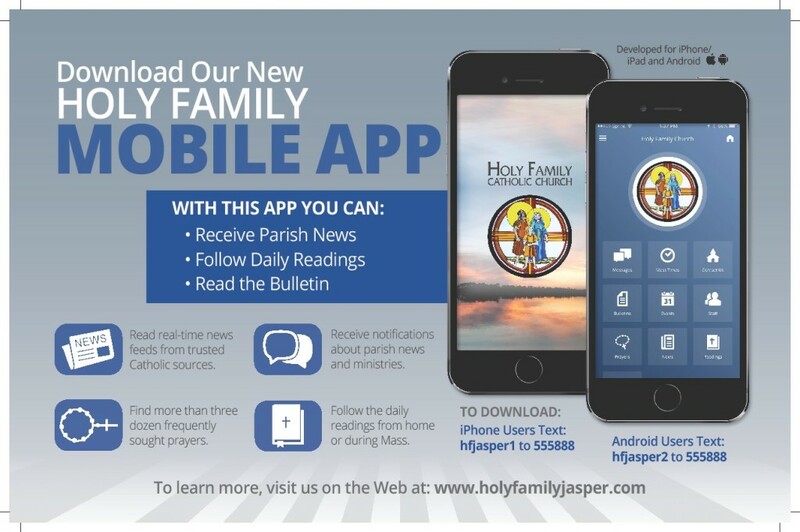 Welcome to our new Mobile APP for Holy Family Parish! Download our APP now to keep up with Mass times, Daily Readings, Ministry Schedules, Catholic resources, the Parish Events Calendar, plus lots more. You will automatically receive general notifications for the parish, and can sign up to receive additional communications for specific ministries, such as Parish Council and Religious Education. Just select on the Notifications screen from the top left drop down menu, then select the ministries you would like to receive notifications from. As always, we welcome your feedback and appreciate the people of Holy Family as you help us to continue our mission of working together to know, love, and serve God.